You've got a brilliant idea for startup. What do you do? Hopefully this article will give you some ideas. Before we jump in, let's make a few things clear. First, search around and make sure someone else hasn't already done it, because the same old ideas do get picked up again and again. Martin Zwilling has more to say about these recycled ideas. Next, you probably heard that you should not hide your ideas in the closet. Chris Dixon explains why in this excellent article from both an entrepreneur and investor's point of view. Knowing that the market for ideas does not exist, you can not sell it. (If not convinced, Joshua Gans' research paper may give you some theoretical grounding.) The best thing to do is probably find a partner, start a company, and make the idea work. But before launching the effort, following are six things you might consider. The best ideas usually emerge after a few rounds of brain storming, iterations of prototyping and tuning. The concept of real-time search was latched on only after many people have used it and explored for a long time. So iteration is useful. Embarkons.com is a social network platform for people to share, cultivate, and tweak ideas. There's even a market place for mature ideas to eventually find funding and launch projects. In addition to finding feedback and getting insights from other peoples' ideas, you may find biz partners as well. Similar sites include Ideablob.com and Ideazinger.com. Ideablob also has regular $10,000 challenge, which picks its winner based on user ratings. It would be a nice bonus if you win. If you are in the mature stage of an idea and want to seek funding for launch, there are a few places to look without bothering a VC. Kickstarter.com has a very interesting "all or nothing" model. You may launch a campaign for a pledge of X amount within say 3 months. If enough people pledge, you get the deal, or else, you still receive plenty of feedback and encouragement. Similar sites include Joel Yatscoff's crowd-funding of ideas. Update: Open Fund wants to fund your startup ideas related to the web and other emerging technologies. The first call for applications is open until Sep. 30, 2009. 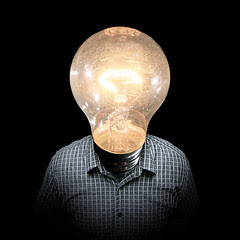 If your idea is more on the improvement of a big corp guy, you may try sharing it on an idea exchange site like innocentive.com or ideasxchange.com, and hope it gets picked up. Chances are slim though. Or, if your ideas are specific, these smart companies have established channels just to tune in to you: Virgin's entrepreneur got a big idea campaign, Dell's idea storm, Starbucks my starbucks ideas. These guys are on the front-line of biz innovation. I was amazed at how many such idea competitions are taking place at any given time. Most of them are local though. One of a recent buzz was put forward by perfectbusiness.com, who invited Sir Richard Branson to review micro-business ideas on Twitter, each under 140 character limit. All you need to do is tweet your idea in reply to @perfectbusiness with hashtag #micropitch, to get a chance to win a $2500 trip to L.A. for further elaboration of your idea. A really neat idea by itself! If you're into B2B selling, then take a look at another ongoing $10,000 startup idea challenge launched by Chinese Alibaba.com. Ideas come and go. Some are witty, funny, intriguing, yet you just don't know how practical it is, then come to halfbakery.com. As the creator put it, it's a communal database of poorly thought-out ideas for inventions. Quite a lot of interesting people hanging out there, and once in a while, there is something truly unique pop up. A good site almost always has a clone. For halfbakery, it's whynot.net. Well, if after exhausting all of above, you still don't know what to do with your brilliant, original, world-changing idea, then just tweet it on Twitter.com, and tweet it again. Search people from the keywords in your ideas and tweet them. Good things will happen. That concludes my short summary of things to do with your brilliant startup ideas. Hope you found this useful. If you find any other ideas on ideas, please, do contact me and let me know. Thanks.